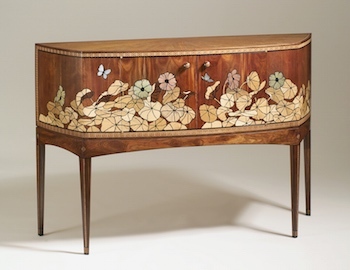 In January my sideboard buffet, Nasturtiums, was acquired by the Philadelphia Museum of Art. This is especially pleasing to me as I am a Pennsylvania native and PMA is one of America’s great art museums. The piece features stylized marquetry using wood, brass, copper, mother-of-pearl, and abalone shell. The main wood used is granadillo. Geometric bandings border the panels. My intent was to make the decoration mimic stained glass. All of the marquetry motifs are surrounded by black wood looking like the leaded parts of windows.